This is the woman who convinced me to register! Let me begin by saying that I seriously considered transferring my entry for Dirty Kanza. About a month out, I realized that I hadn't trained nearly enough and was rapidly running out of time to correct that mistake. 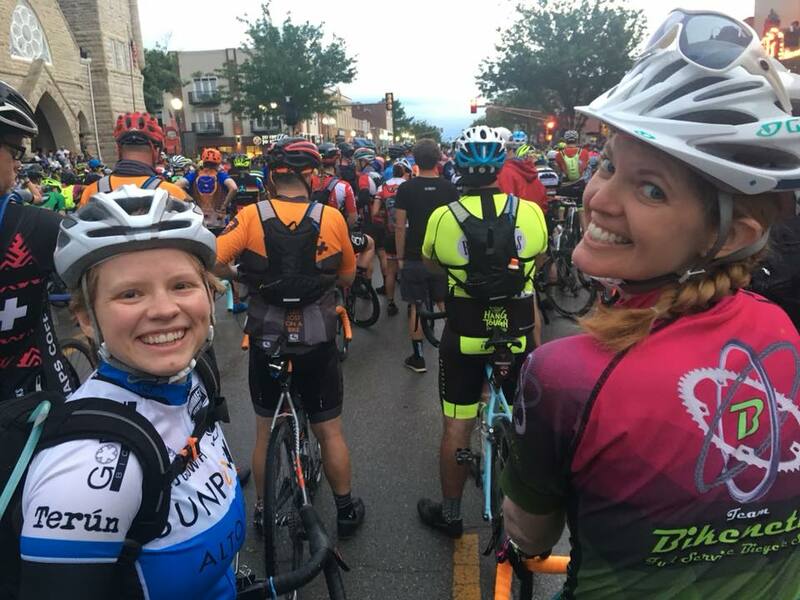 I talked with Emily and my parents about not doing the race, but in the process of that discussion I realized that, as much as I might regret doing the event while I was doing it, I would regret missing the opportunity much more. With that in mind, I committed to going out there and doing my best, whether that meant 50 miles or 206. 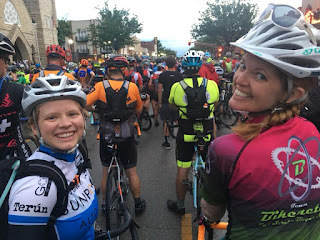 My Dirty Kanza prep was impacted by the preceding week--specifically, the fact that we flew to Ottawa to visit Emily's family for Memorial Day. I was in charge of booking flights, and I accidentally booked the return trip a day later than I'd intended (not the first time I've screwed up travel dates)! So we flew in from Ottawa to SFO on Wednesday at 1:00 AM. At 9:45 AM on Wednesday, I flew out of SJC for Kansas. That meant I had to have everything--bike bag, clothes, any equipment--packed for the Kanza trip an extra week in advance. That didn't cause any specific problems, but it introduced an extra layer of stress to my preparations. I reassembled my bike in Wichita and had no brakes, which I'd sort of expected; I'd heard that flying with a bike is likely to introduce air into hydraulic brake lines. In anticipation, I had pre-scheduled an appointment at my former local bike shop (Bicycle X-Change in Wichita, Kansas) with my favorite ever mechanic (and adopted big brother, Jack) to have my bike pre-Kanza tuned. They were able to get the brakes bled and had everything tuned in time for me to pick it up on Friday afternoon, and the whole bike braked and shifted better than it has since I bought it! I love that I have mechanics I can trust all over the country! I wasn't together enough to get any kind of housing in Emporia, so my parents and I drove to Emporia on Friday morning for check in and back again Friday afternoon. It was blazing hot on Friday--heat index well above 100*F! The warmest temperatures I'd experienced so far this year had come in Ontario, where the temperatures were in the mid-80s. It's still cool enough in Northern California that I have to wear knee warmers in the mornings. I knew I was unprepared for the heat. Friday's weather did not give me positive feelings. Fortunately, a thunderstorm blasted through Emporia in the wee hours of Saturday morning, cooling everything off for the day-of. Speaking of that thunderstorm, since we didn't have a place to stay in Emporia, we had to drive up on Saturday morning. We left at 4:15 AM. We woke up at 3:30 AM. I have a rule about this, honed over years of early mornings at various gyms: if it's before 4:30 AM, it's not the morning; it's the night before. Which is to say, no one should be waking up at 3:30 AM. Ever. Anyway. The thunderstorm. It blew through Wichita a few hours before we left, and we caught it on the interstate. My dad was driving, but I could feel how strong the wind was blowing from the backseat. There were areas where he slowed down from the speed limit of 75 MPH to 55 MPH, because any higher speed would have been dangerous. We arrived safely in Emporia, but late. By that time, the thunderstorm had moved into Emporia, and the start time was delayed by 30 minutes. That gave me time to visit the bathroom and make sure my bike was ready to go. By the time we rolled out of Emporia, the skies were clearing and the air temperature was perfect. Standing on the line with my friend (the one who convinced me to sign up for the lottery when I was a few beers in), I felt mostly confident, ready for what the day would bring. I went too hard in the first hour. There were so many people, and we were on wide roads, and my roadie-ness took over. I told myself it would be worth it to push a little harder initially to stay with a strong group. One of the disadvantages of drafting in a pack was that I got covered in mud. It wasn't really worth drafting, considering that I couldn't see where I was going through the mud on my sunglasses. After about 90 minutes, I was able to let the group mentality go and tried to go my own pace. The rest of the first segment went pretty well, although my undercarriage wasseriously chafing, and my back was starting to ache. By the time I got to the first aid station, I was extremely ready to be off of my bike. I didn't spend a ton of time at the first rest stop. Did I mention I'd started my period on Friday? That was an extra element of fun to deal with throughout the day. I took care of that, went to the bathroom, re-stocked on food and drink. My bike needed some work. It had accumulated mud that had turned to cement on my drivetrain. My parents helped by cleaning and lubing the chain while I ate. Once the bike was back in working order, I climbed back on and rolled off reluctantly. From the top of the hill! The second segment was tougher. We climbed more, including a big climb culminating in a beautiful view at mile 65. I stopped at the top to pee, take some pictures, have a snack. My back was seizing up, but I noticed that I felt much better after even a short break off the bike. I decided I would start taking breaks every 10 miles or so to let my back rest. The next several miles felt great. I've never--even in my Ironman--experienced such drastic swings between feeling miserable and feeling great. Miles 65-80 felt terrific. It was mostly downhill, mostly tailwind, my whole body and mind felt better than they had just half an hour before. I started to think I would at least be able to make it halfway, although I also had moments of telling myself I should quit while I was ahead. I ran out of water at mile 80, and tried to nurse half a bottle of drink mix through the next 20 miles. Shout out to rider #241, who gave me all the water out of one of his bottles, and to the family near Eureka who gave out water! They saved me from getting behind on my hydration through that stretch. Without them, I would have been in a bad way by the time I got to the Eureka stop. All alone out here. Just me and the cows. When I arrived at the second aid station (mile 103), I got a cool surprise: my dad's friend and fellow C.O.G.S. (Crazy Old Guys in Spandex, which is what you become after a M.A.M.I.L.) drove all the way from Wichita to Eureka to see me come through the aid station! Seeing him and his wife gave me inspiration to keep going. I took a loooong break in Eureka, though. I was 2 hours ahead of the time cut-off, and I took full advantage. I did a total kit change, went to the (flushing!) toilets in the high school twice, ate as much watermelon as I could, and sat in the shade in a camp chair for probably 20 minutes. I rolled out fully expecting to need to call my parents to pick me up within the next 10 miles. Ethel's still looking good at this point. But I didn't. I got to mile 115, took my promised break to unkink my back, then actually got back on and kept pedaling. By mile 120, I needed another back break. All day, I'd been asking myself in my head how I would know when it was time to quit and pack it in. Emily made me promise not to overdo (although can you do an event like DK200 without overdoing?). My mom reminded me in Eureka that I had nothing to prove to anyone. Around mile 120, I decided that if I got to where I needed to stop and stretch my back every minute, it would be time to pack it in. And really, I wasn't going much more than a minute at a time. I would get off the bike, stand up, stretch, get back on, and immediately need to do it again. During one of those breaks, I dropped my bike saddle by a few millimeters, hoping that would help. It did help the chafing, but not the back pain. The darkest moments of the day were miles 125-140, where it was mostly uphill, blistering hot, in the glaring sun, into a stiff headwind, with no relief in sight. Still, I passed a few who were worse off, including one guy who was pulled over to the side of the road throwing up. I gave him some of my Pepto Bismal tablets. Then, around mile 140, it suddenly got easier again. A lot of the steep climbing was behind us, the sun was setting, the wind was calming down, the air was getting cooler. I turned on my lights. My body felt miraculously good! Even my back calmed down. I knew then that I was going to make it to the third aid station at mile 160, with plenty of time to make the cut-off. And, as much as I tried to tell myself I would quit there in Madison, I knew that I would probably get back on my bike, planning to call my parents soon thereafter to come get me. But I'd told myself the same thing after the first and second aid station, and had made it that far. So I figured if I set off from Madison, with only 46 miles to go, I would finish. Unthinkably, with the amount of training I'd done going into the Dirty Kanza, I might actually finish it. I could see the light at the end of the tunnel. But. But but but. My right shifter had been acting wonky going into Eureka. It was getting stiffer and stiffer, harder to shift. That continued after the aid station, but I could still get it to shift. Shortly before mile 151, it finally got stuck and I couldn't get it to shift anymore. I was stuck in my easiest gear, spinning my legs at 6-7 MPH. And while I knew I could still get to Madison before the cut-off, I knew I wouldn't make it to the finish by the 3:00 AM deadline going 6 MPH the whole way. I thought about continuing on to Madison, but it was annoying spinning and going nowhere. I called my mom and told her the bike broke and I was done. They got ready to pack up and come get me, and I kept spinning along, thinking I would meet them somewhere along the way. She called back and said they weren't allowed to drive backwards on the course, so we tried to figure out where to meet along the way. While I was on the phone, some volunteers pulled up (they were coming back from their post at one of the creek crossings) and offered me a ride! So I rode in with them in their Jeep. Got back to my parents' car around 10:30, and we packed up and cleared out. I feel good about the event. My bike broke before my body did, but my body was very grateful to have the excuse to stop. I got to stop during one of my high points. Re-reading this report, I don't think I can fully communicate how hard it was and how little I believed I could do the whole thing. Really, until mile 140, I was asking myself continually if I should quit and give up, how far I needed to go before I could let myself give up. My back was so stiff at points that I couldn't pedal anymore. I didn't think I could physically make it through the full 206 miles. But I think (and my parents agree, for what that's worth) that I would have finished if my bike hadn't stopped working. And I could have gotten my bike to work again probably if I had made it to Madison. The shifter breaking was the final push I needed, though, to throw in the towel. I did a really good job of hydrating and eating. At no point did I feel dehydrated or depleted. I applied and reapplied sunscreen consistently enough that I didn't get burned, or even that much more tan than I already was. In fact, my mom got a sunburn and I didn't! I ran tubes in my tires, which I thought was going to be a disaster. Long story, and it involves a pair of rims that I'd never run tubeless before . . . they're tubeless ready, but I think they need to be re-taped (I got them used). Anyway, I only had one flat, and it's because I mistimed a bunny hop over a lip of concrete on a cattle grate. If I'd just slowed down and rolled over it, I wouldn't have had a single flat. And I changed that sucker in no time. Tubes weren't a liability for me at all, at least not on this attempt. I did way more than I thought I could. I was skeptical going into it that I would even be able to make it halfway. Slowing down for steep, rough descents and taking good lines. Being alone. I discovered on this ride that I prefer riding alone. I didn't want to find a buddy or a group; I didn't want to chat to pass the time. Some of my favorite moments were when things were so spread out that I couldn't see anyone in front of me or behind me, and could enjoy the feeling of total solitude. That was especially moving after the sun set. Really, when else will I got to be so isolated, away from all people, houses, settlements, in the dark alone with my thoughts and the stars? It was a breathtaking experience. That in itself was worth the price of admission (and all the pain that went along with it). More training and more specific training. I had a lot going on while training for Dirty Kanza. Moving across the country, finding a new team, racing with the new team, finishing pre-reqs, applying for and getting into grad school . . . but it's not like I wasn't riding my bike. I wasn't doing the training I needed, and I wasn't using my Crux. So in addition to having done no rides over 88 miles, I hadn't done those long rides on the bike I used for Dirty Kanza. If I'd had more time on my Crux, maybe my back wouldn't have locked up so much. Or I would have known that it would lock up, and changed my fit to fix it. Book a place in Emporia very early. There's no reason to get up at 3:30 AM on the day of a huge event. Bring at least 3 bottles, in addition to a hydration pack. Whatever happens, do not run out of water. Practice nutrition ahead of time--don't rely on past experience! I used S'mores Pop-Tarts in my Ironman with great success, but they were much harder to stomach with temperatures in excess of 90*. Use a bike with less aggressive, race-oriented geometry and have it fit specifically for DK (and DK training). Spare shorts were a great idea. Spare socks for each aid station would be even better. And it wouldn't hurt to have a pair of spare shoes, either. Don't wear white jerseys unless you're okay with them never being white again. Ever. Bring camp chairs for the aid stations. Some kind of liquid painkiller that got into my system quickly would have been great. I think part of the reason I felt so good at mile 140 is that the ibuprofen I'd taken earlier finally kicked in. Bring a brighter headlight. It needs to be a "see" headlight, not just a "be seen" headlight. Practice mental strategy and better self-talk. I used too much energy talking myself into continuing. Use a power meter for pacing. I have a PowerTap wheel on my road bike, but no power meter on my CX bikes. I'm thinking I'll get a PowerTap wheel for my CX bike, too, and use it to train for DK next year and to pace my effort, especially early on when my body feels good and I want to ride fast. Core strength, back flexibility, hamstring flexibility, and upper body strength. I knew months ago that my upper body was likely to give out before my endurance ran out, but I still didn't put in the work to make sure that wouldn't limit me. If I had put in the necessary time and work (as I knew I should) with weight training, core training, and yoga, I would have had an easier time of the whole thing. Then again, maybe that back ache was what I got instead of menstrual cramps with my period. I will make another attempt at Dirty Kanza, I hope in 2019. That will depend to a great extent on my school schedule, since I'll be spending 7 weekends per term in San Diego for labs and exams. But perhaps those weekends will fall in a way that I will still be able to travel to Kansas for DK 2019. And this time, my body and bike will be prepared!